Hi folks! I have many projects in the works as usual, but I wanted to take a break from stitching hexagons to give all you locals a head’s up about some classes I’m teaching this summer at Lakeshore Sewing’s Wyoming location (1011 Gezon Parkway SW, Wyoming, MI). 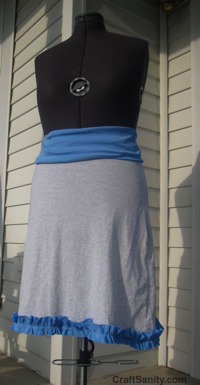 Learn how to convert t-shirts into unique refashioned garments. Bring three or four old t-shirts in your favorite colors (the bigger the better) along to class and a pair of sewing scissors and other basic sewing supplies. 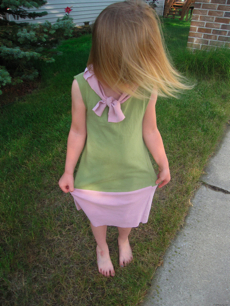 (I made the sample skirt on the dress form using the back of two XL shirts. The ruffle and waistband came from a third XL shirt. Bring your own sewing machine or call to reserve a store machine to transform those shirts from the bottom of the drawer into “new” additions to your wardrobe. Tops, skirts, dresses and fashion scarves are among the refashioning possibilities. Cost: $15; One session, 10 a.m. -noon, Wednesday, July 28. 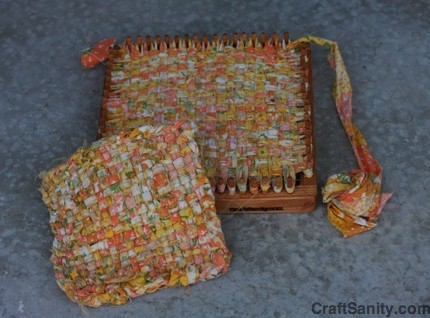 Learn how to weave using a wooden CraftSanity peg weaving loom reminiscent of the old potholder loom from your childhood. The class will cover basic techniques for weaving with cotton fabric strips and handmade loopers cut from recycled T-shirts to make hot pads, coasters, placemats, table runners, rugs, bags, and more. Learn how to prep cotton yardage and t-shirt loopers for weaving. Bring sewing scissors, t-shirts and fabric in colors you want to weave with. Looms will be provided for classroom use. To register, call the store at 616-531-5561.